40+ years combined experience. 19,000+ flight hours. The best of the best. Cinematic Aerospace's edge is our team of extremely experienced, intelligent, and well-connected management personnel and pilots. With over 40 years of experience working in the National Airspace System, our team knows all too well what is at stake when it comes to aircraft and film productions. That is, everyone must go home at the end of the day. From flying aerobatics in competition, to working on production after production with manned helicopters, our pilots know exactly how to get everyone home safely at the end of the day while still producing some of the most stunning visuals. David’s background in aviation and business proves to be an excellent combination for the UAS industry. The fast-paced growth of this industry is the perfect match for David’s own fast-paced, “full speed ahead” attitude. David’s amazing resume of aviation experience began when he soloed on his 16th birthday. He obtained his flight instructor rating at age 18 and since then has logged over 18,000 flight hours, including 4000+ turbine hours and 200+ hours with UAS. These hours have been logged over a large number of experiences that most in the aviation industry only dream of doing. David has secured certificates and ratings in numerous fields including his airline transport pilot AMEL, commercial pilot ASEL and SESEA, rotorcraft-helicopter and glider. He is a certified flight instructor in airplanes, single and multi-engine as well as rotorcraft/helicopters, has a type rating for CE 500 all variants, a single pilot Cessna Citation FAA waiver, an FAA aerobatic competency waiver for Level 1, and a current class II medical certificate. 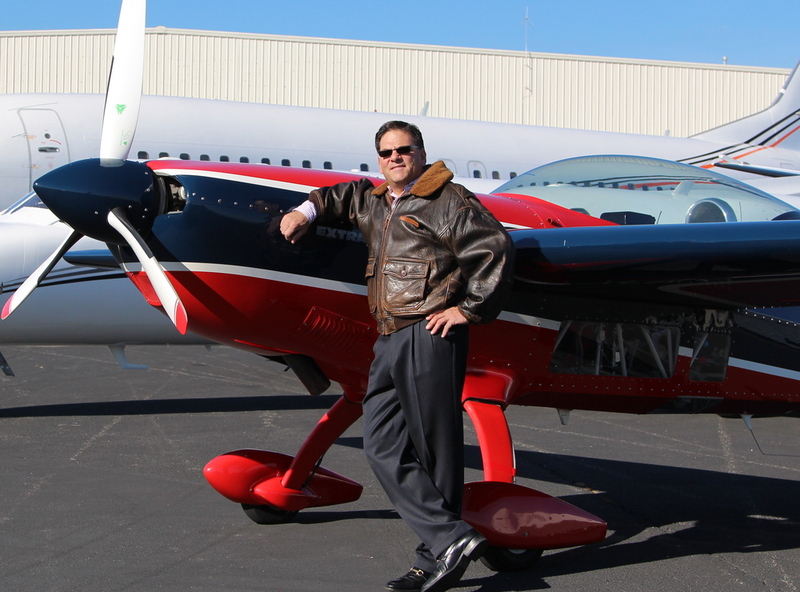 David’s flying experience continues through various unique opportunities such as working as a test pilot for Teledyne Continental Motors and Extra Aircraft, where he is also a factory sponsored pilot. He was a member of the United States Unlimited Aerobatic Team from 1999-2001 and placed 4th in the World Aerobatic Championship. David currently performs as an air show pilot and is the owner and chief pilot of Vxperts Aviation, an Upset Prevention and Recovery Training Flight School. He has worked closely with the FAA on a number of FAA FAAST Team Seminars where he has run spin seminars and demonstrations. David also volunteers as a Wounded Warriors and Special Olympics transporter. David’s pilot work in the aerial cinematography industry includes credits such as Royal Pains, The Path, The Mysteries of Laura, Blind Spot, Gold, Garth Brooks Live at Yankee Stadium, Homeland and Younger. He is a member of the Screen Actors Guild. David Windmiller is committed to safety and tirelessly strives for excellence in all he does as well as a super efficient and safe operation. As a father of five beautiful children, David truly understands the importance of everyone making it home safely at the end of a production day. Christian brings a strong background in aerial cinematography and electronics and his level of knowledge in closed-set aerial cinematography operations is considered advanced. Since age 13, Christian has worked extensively in the aerial cinematography industry. From the beginning, Christian learned the business from his now long-time friend and mentor, Al Cerullo, of Hover-Views Unlimited, Inc. the east coast’s top aerial film pilot and aerial cinematography company. Christian provides a variety of services in the aerial cinematography industry to a multitude of clients including aerial coordination and safety, cinematography, photography, digital imaging technician services, and post-production editing. Part of Christian’s work with manned helicopters involves working as part of the flight crew while on film productions. He possesses a knowledge of helicopters and safety operations that ensure the cast and crew of a production remain safe and effective while working around aircraft at an airport, heliport, or in the field. Christian strives for a “120%” safe operation, something that is necessary while working around full size turbine helicopters and airplanes. While UAS prove to be safer in many areas because of their much smaller size, Christian’s experiences in manned aircraft safety operations will no doubt be an asset to Cinematic Aerospace’s attitude of “safety first”. Christian also has a large background in working with clients to assist in their various FAA paperwork needs in regards to aerial cinematography and motion picture/television operations, including in the Washington D.C. SFRA. He has a solid understanding of the various filing requirements and methods and has years of filing experience for Motion Picture and Television Flight Operation Manuals, FAA Plan of Activities, FAA COAs, and FAA/TSA FRZ Waivers for the Washington D.C. area. This existing experience proves to be valuable to the kind of regulations that Cinematic Aerospace will be held to for it’s primary mission of closed-set filmmaking. Christian has also worked extensively within airport operations, where he is licensed to operate vehicles within the secured safety perimeter of the airfield. He understands the complexities of the commercial airport environment, and his time in the aviation world working at the airport has given him a full appreciation for safety in aviation. World-renowned film and stunt pilot with 25,000+ flight hours and hundreds of productions on his resume. Recipient of 2009 Society of Camera Operators Lifetime Achievement Award. Owns the well-known aerial film company, Hover-Views Unlimited, based on Long Island, New York. Life-long aviation enthusiast with a passion for all things airborne, serving as a manager with Long Island Aviators and Treasurer of the Republic chapter of Women in Aviation. Kyle holds an ASEL private pilot rating alongside a Part 107 Remote Pilot Certificate. 21-year veteran of the NYPD Aviation Unit, serving as Chief Pilot both with the NYPD and NJ Police Department. Founder and lead instructor at Code Red Training, Inc., provider of aviation, emergency medical and safety training. Sought after instructor and consultant in all things aviation safety.